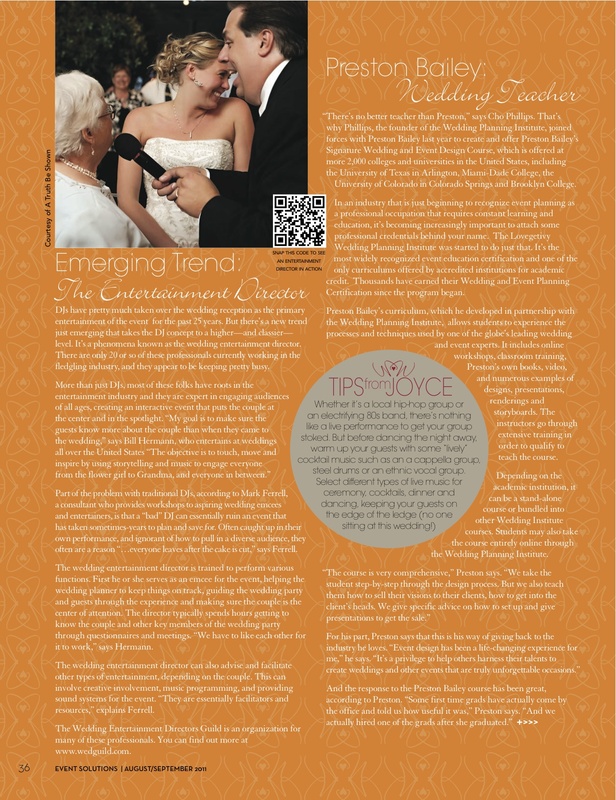 In their September issue that features the likes of Preston Bailey and David Tutera, Event Solutions Magazine spotlights Wedding Entertainment Directors in their “Emerging Trends ” portfolio. 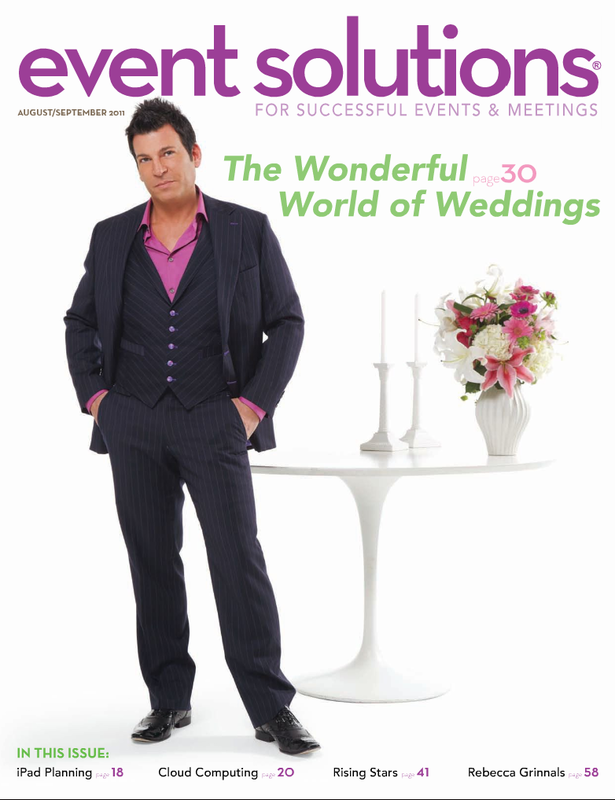 My good friend, and fellow Entertainment Director from Minnesota, Bill Hermann, was interviewed for the piece and did a stellar job speaking on behalf of the Wedding Entertainment Directors Guild. Having my application accepted back in 2007 was a career highlight and still being the only member from the tri-state area to qualify continues to be a significant way for MMP’s clients to differentiate my offerings from other qualified talent they may be considering. If you or someone you know is getting married and needs help producing a Wedding celebration that is a true reflection of your personality and style, if you like the concept of entertainment with elegance, and if you are willing to invest accordingly, contact us at 973-366-9776 or mmp@mmpentertainment.com to schedule a design session. I’m at your service, -mp. Below is a text reprint from the Event Solutions Magazine article. “DJs have pretty much taken over the wedding reception as the primary entertainment of the event for the past 25 years. But there’s a new trend just emerging that takes the DJ concept to a higher—and classier—level. It’s a phenomena known as the wedding entertainment director. There are only 20 or so of these professionals currently working in the fledgling industry, and they appear to be keeping pretty busy. Part of the problem with traditional DJs, according to Mark Ferrell, a consultant who provides workshops to aspiring wedding emcees and entertainers, is that a “bad” DJ can essentially ruin an event that has taken sometimes-years to plan and save for. Often caught up in their own performance, and ignorant of how to pull in a diverse audience, they often are a reason “…everyone leaves after the cake is cut,” says Ferrell. The wedding entertainment director is trained to perform various functions. First he or she serves as an emcee for the event, helping the wedding planner to keep things on track, guiding the wedding party and guests through the experience and making sure the couple is the center of attention. The director typically spends hours getting to know the couple and other key members of the wedding party through questionnaires and meetings. “We have to like each other for it to work,” says Hermann. The wedding entertainment director can also advise and facilitate other types of entertainment, depending on the couple. This can involve creative involvement, music programming, and providing sound systems for the event. “They are essentially facilitators and resources,” explains Ferrell.